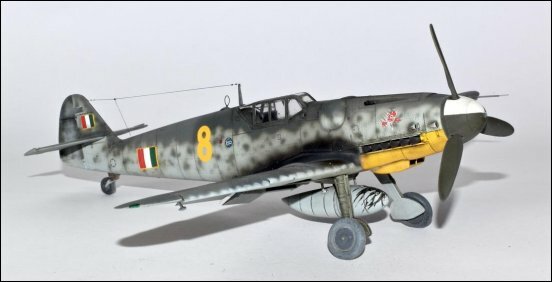 Messerschmitt's Bf 109, the backbone of the Luftwaffe fighter force, had reached its pinnacle with production of the F series and as the Luftwaffe began taking delivery of the "Fritz" no successor to the Messerschmitt progeny was on the drawing board. 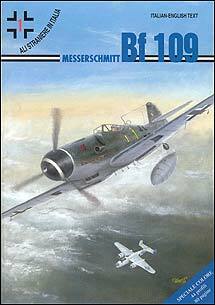 Consequently, during the summer of 1941, as the German juggernaut knifed deep into Russia, the Messerschmitt design team was engaged in an update of the now aging Bf 109. 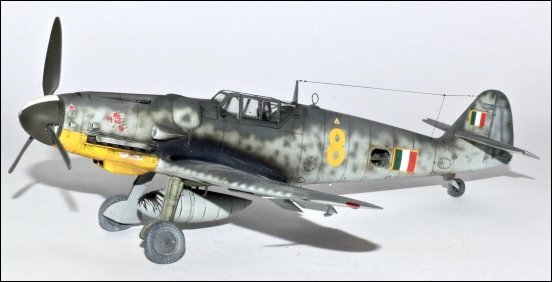 Under the designation Bf 109G, or "Gustav" as it affectionately became known among its pilots, this version was to become the most numerously produced variant. Dictates of the air war forced the Messerschmitt design people to sacrifice handling and maneuverability in order to increase maximum speed. Designed around the more powerful but heavier Daimler-Benz DB 605 engine, local strengthening was required which increased weight which, in turn, required that the undercarriage be strengthened which again increased weight; all of which increased wing loading and decreased handling characteristics. The DB 605A powerplant featured an increased cylinder capacity that raised compression to 7.3 in the port cylinder bank and 7.5 in the starboard, increasing rpms to 2800 and horsepower to 1,475 at take off, with no increase in overall engine dimensions. Weight of the new G series escalated to over 6500 lbs, but the RLM felt that, given war conditions, the consequent loss of handling was a fair trade off with the gain in power and speed achieved by the DB 605 installation. Many pilots in the field felt otherwise, claiming that the "G" series was a regressive step from the F series. To house the DB 605A engine, no change was made in the upper contour of the cowling, however the oil cooler was deeper and of a slightly different shape, similiar to the "Z" option of the F. There were a number of differences in the panel lines forward of the cockpit especially around the windscreen where the lower oblique glass panel was deleted. The size of the supercharger intake was the same as the F-4 and the broad-bladed propeller of the "Z" became standard. However, without close examination the "Gustav" was in fact quite similar in appearance to its predecessor. A redesign of the fuel tank caused the fuel filler to be relocated from below the cockpit to the spine behind the cockpit. The wheel wells again reverted to the squared shape of the E and early F types in anticipation of covers that were never produced. Production of the DB 605 powerplant was delayed, consequently the preproduction batch of twelve Bf 109G-0s were completed with DB 601E engines during fall and winter of 1941. The cowling and other external features of the G-0, however, were essentially the same as subsequent DB 605 equipped production machines. The DB 605A-1 was finally certified for production installation during early spring of 1942 with production of both the G-1 and G-2 commencing immediately. 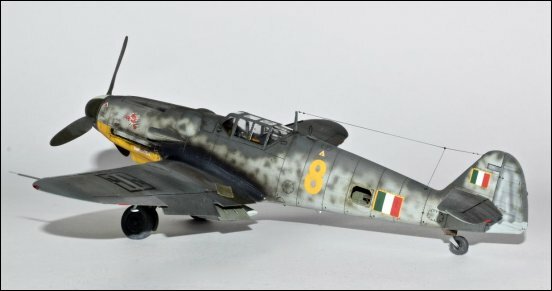 The pressurized G-1 and non-pressurized G-2 were run simultaneously on the assembly line, being essentially pressurized and unpressurized versions of the same variant, however, the Bf 109G-2 actually preceded the G-1 s service introduction by several weeks. Provision was made for installation of a GM 1 nitrous oxide power boost system, previously used on the 'Z' option powerboost system under the designation U-2. Weighing more than 400 lbs, the GM 1 nitrous oxide system, known as Goring's Mischung (Goring's mixture), had a tremendous affect on performance, not only allowing the G to operate above the rated altitude for the DB 605, but to literally leave a pursuing Spitfire V standing still. A short time after service introduction of the G series, operational units began reporting fires shortly after take off, sometimes causing the loss of both aircraft and pilot. Testing eventually showed that during overheating the horseshoe shaped nose mounted oil tank seeped oil onto the hot engine, causing a flash fire. After ascertaining the problem, two small cooling scoops were introduced on each side of the nose, cooling the oil tank. General Kesselring and others have attributed the death of Hans-Joachim Marseilles to one of these oil fires, however, British Aviation Historian Jack Foreman has reported that a fracture in the glycol line was responsible for the fire that forced Marseille to fatally abandon his aircraft. Marseille was flying a Bf 109G-2 W. Mr. 14256. Low oil pressure plagued the DB 605 engine throughout its operational career. Damiler- Benz maintained that the horseshoe oil tank was at fault while the Messerschmitt people claimed that the hydraulic supercharger trapped air bubbles in the oil. Eventually the DB people developed and installed a de-aerator but when no improvement was found the deaerator was discarded. The oil pressure problem was never satisfactorily solved. 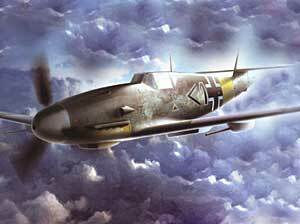 Augurini to you my old friends and Long live Stormo!. I share with you my latest build for one customer of mine! Cheers. 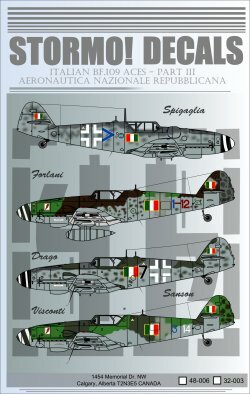 Stormo Decals Bf.109 Italian Aces Part III used here + the Eduard 1/48 kit.